We were supposed to have visited Joe and Linda in Michigan, but we postponed that side trip until another year. Andy and I had both read articles about a possible budget standoff and another government (well, our concern was national park) shutdown. We saw all the Utah national parks in September and did not have to worry about being shut out again. I saw on Facebook that Joe and Linda had arrived in Port Charlotte and made contact. We left Wildwood at 0905 and arrived at their house at 1315. It was only 159 miles. Here is Sao parked in their driveway. We sat and talked in the living room with cold drinks. 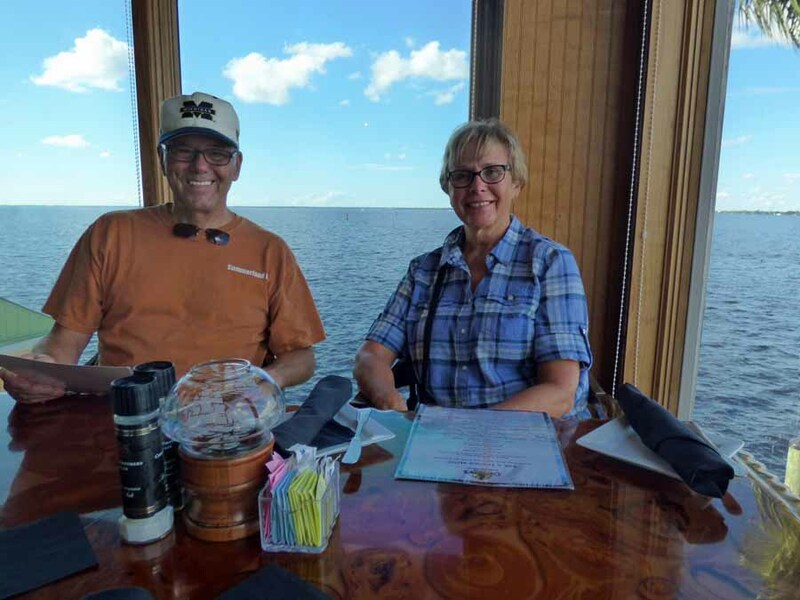 When the hunger pangs began, Linda suggested that we take their boat across Charlotte Harbor to Fisherman’s Village to eat at a restaurant on the water. Here, they are putting the bimini on the boat. Bummer. the boat battery was dead. It had been fully charged, but something is draining it overnight. We drove to Fisherman’s Village in the car. It is a waterfront shopping arcade with cutesy and touristy shops. You walk past them to get to the restaurant on the waterfront. It was late afternoon and we may have been the only patrons in there. We got a great table in the corner with windows on two sides. The one on the side faces the marina. Joe and Linda are about the cutest couple I’ve ever known. Our vehicle goes by many names. RV for Recreational Vehicle is the general term that would include trailers, vans, and motorhomes. Ours is a motorhome, but they are also called campers, coaches, rigs, and buses. When we traveled in a small RV in Europe, we learned the word caravan there. I thought a caravan was a group of camels (or vehicles) traveling single file, but they used the term for a single vehicle. Sao is the name we gave it. The make of our motorhome is a Holiday Rambler and the model is a Neptune. Sao is one of Neptune’s moons. Sao, in mythology, was one of the daughters of Neptune and the goddess that looked over sailors. Since the RV is a Neptune and we were boaters, I chose the name Sao. It is pronounced say-oh, as it is Greek. Ah, the weather. That is the beauty of living in a motorhome. We travel north in the summer and come to the Florida Keys for the winter. So, we have spring and summer all year, except when we have to travel north for family. Ha! I like Bummer too. It is so 60s.